Rep. Lemar speaks on 50th anniversary of Fair Housing Act. Since the creation of the Fair Housing Act in 1968, Connecticut has made some progress toward ensuring that our residents have access to housing in every corner of the state, but if we are to ever truly achieve our goals of fully open and integrated communities, we need to enact fair housing reforms and inclusionary zoning so that we can fulfill the promise that the Act firmly envisioned. 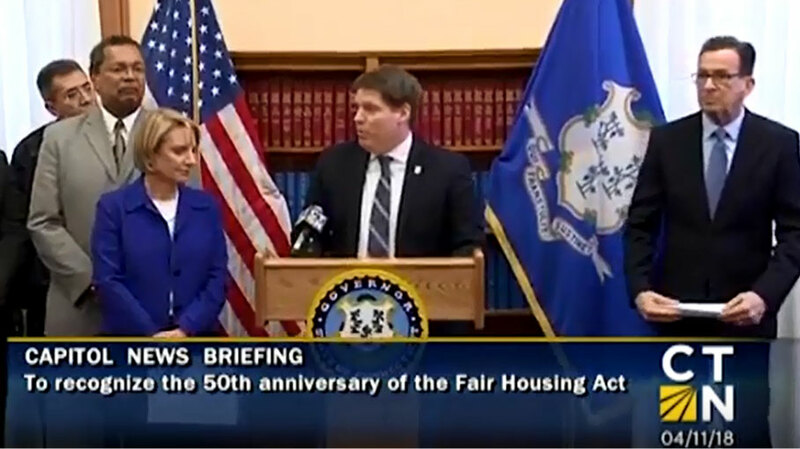 That's why I have co-chaired our State's Fair Housing Working Group with Housing Commissioner Evonne Klein and why I have championed House Bill 5045, which seeks to promote housing choice and ensure local accountability for meeting the housing needs of all Connecticut residents. It's time Connecticut takes a stand and makes sure everyone can live and work where they choose, no matter their race or economic bracket. The sweeping reforms of the Fair Housing Act were enacted just seven days after the assassination of Dr. Martin Luther King Jr. In recognition of the 50th anniversary, Gov. Dannel Malloy proclaimed April 11, 2018, as “Fair Housing Day” in the State of Connecticut. To continue the significant progress made in Connecticut in recent years in the areas of affordable housing development and ending homelessness, the governor this session introduced legislation HB 5045.